Students will learn how to provide the real estate services—at any stage in the service member’s military career—that meet the needs of this niche market and win future referrals. 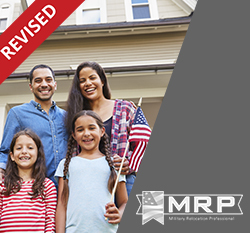 Hone in your knowledge and skills for working with active duty military buyers and sellers, as well as veterans with the NAR's Military Relocation Professional Certification. Complete the one-day Military Relocation Professional (MRP) Certification course. Take this course online through REALTOR® University. There is a one-time application fee of $195. Bonus! The Military Relocation Professional Certification course is an approved elective for the Accredited Buyer's Representative (ABR®) designation.